You say Christmas; Jesse Lagers says Halloween. Jesse discovered his love for costumes and props as a young boy when he found himself continually dressed in disguise even after his favorite autumn holiday. A self-described "geek through-and-through" he pools his influence from science-fiction and Medieval romantic era graphic novels, movies, video games and more. 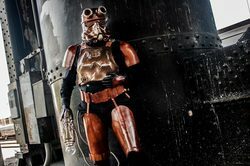 Star Wars, being Jesse's favorite influence, has shown him how powerful and essential movie costumes and prop designs are to the success and popularity of feature films. An Oregon-bred pirate, Jesse currently lives on a boat with his girlfriend and pet rat on the river near Portland. He has a business building custom costumes and props by request, which has become a full-time pursuit. His realistic cosplay style, down to adding dirt and grit to battle outfits, exemplifies his passion for authenticity within the costume design industry. Contributing to his ability to bring realism to cosplay is his experience as a storm trooper with the 501st Legion: Vader's Fist, a national organization of "Star Wars" enthusiasts who celebrate the series' mythology and perform community fundraising, charity work and volunteerism. You might have seen his work featured on SyFy's Heroes of Cosplay.